Poison Ivy has climbed up this tree, but it’s also growing all over the ground to the right of the tree. 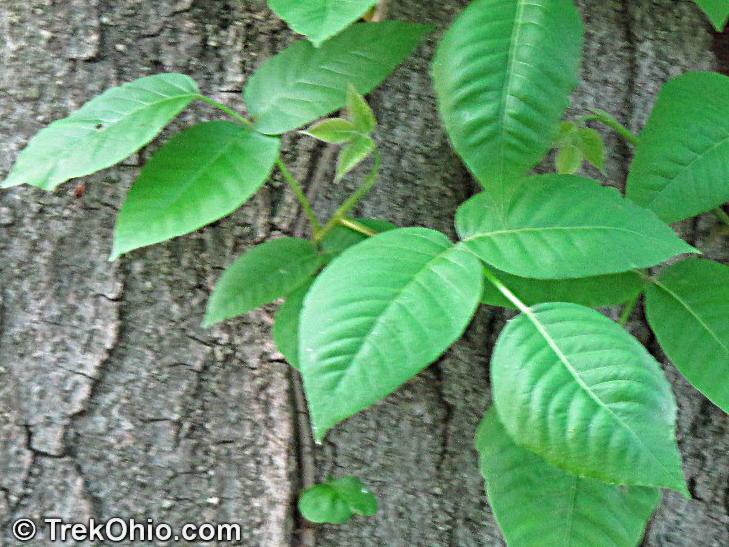 If you hike in Ohio, sooner or later you’ll run into poison ivy or poison sumac. Probably sooner than later. They produce an irritating resin called urushiol that can produce a strong allergic reaction on contact in most people. The resin is found in all portions of the plant. Merely touching the plant can result in a rash and blisters within a few days. Poison ivy (toxicodendron radicans) is often found in wooded areas as either a ground cover or as a climbing vine clinging to the side of trees. 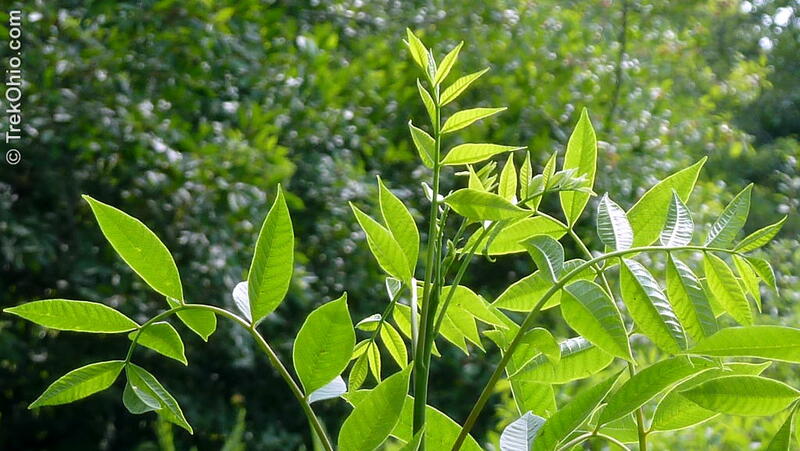 Its leaves appear in groups of three. 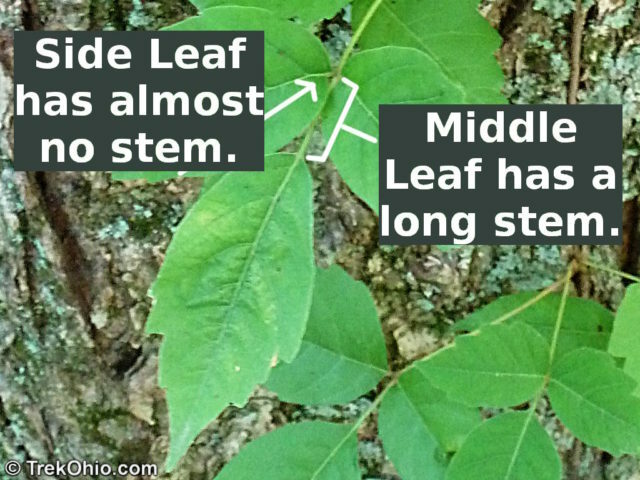 The middle leaf is somewhat longer than the two side leaves. The vine looks hairy. The plant has yellow or greenish-white flowers. When fertilized these produce clusters of whitish berries. Poison Ivy is deciduous, so its leaves turn orange to red in the autumn, then drop off. Even when the leaves are gone, people can get a rash if they touch the vine. It’s white berries persist into the winter and are a valuable food source for birds and animals (though poisonous to us). 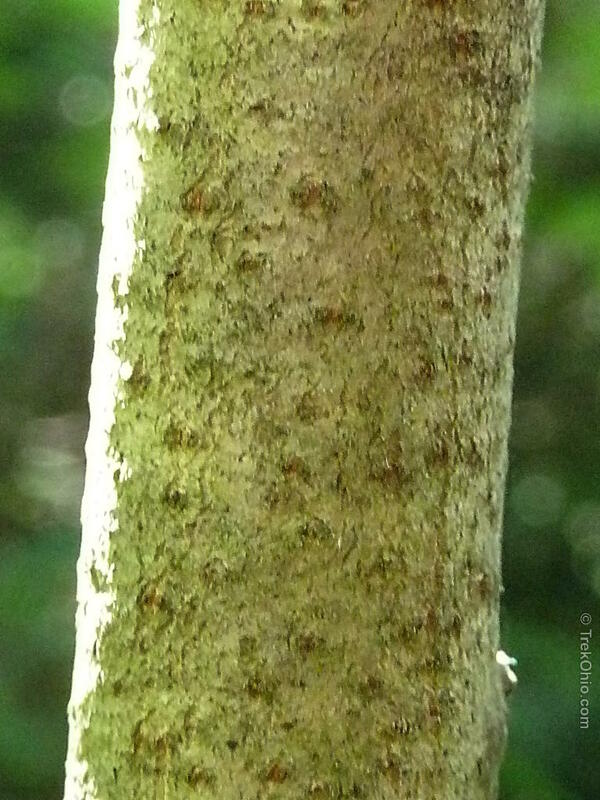 In the spring its new leaves also have a reddish tint, which turn green in the summer. The Wikipedia article on Poison Ivy ends with a list of traditional mnemonics to help people identify Poison Ivy. I thought it would be fun to re-print a few of them here along with a photo illustrating the saying. Leaves of three; let it be. The catch is that there are plenty of plants with three leaves that are safe to touch, such as wild strawberry vines. Blue Jay Barrens blogged about safe, three-leaved plants in a post called Three-Parted Leaves. But if you have difficulty telling one three-leaved plant from another, it’s probably best to avoid them. Side leaflets like mittens, will itch like the dickens. 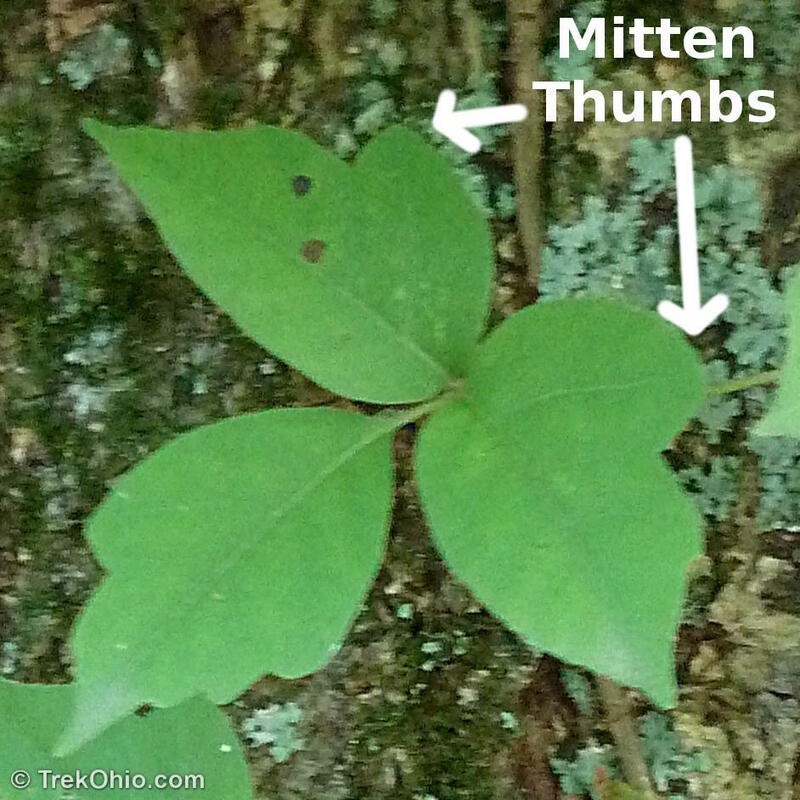 Unfortunately the side leaflets on poison ivy don’t always have these mitten thumbs. If you look at the “leaves of three” photo shown in the previous item, you’ll note that it lacks these mitten thumbs. Longer middle stem; stay away from them. Red leaflets in the spring, it’s a dangerous thing. The above photo was taken April 27th. It is unusual to see red leaves in the spring. This was taken January 13th after all the leaves were gone. The vine is still poisonous. This was photographed on December 8th, also after the leaves had dropped. Although they are no good for people, birds and animals can eat them without having any problems. Yellow-rumped warbler eating poison ivy berries. 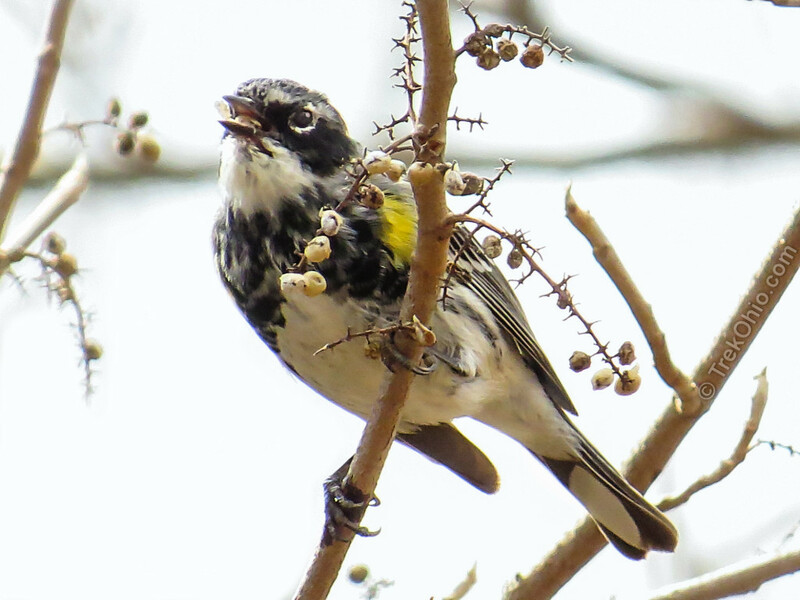 These berries remain on the vines most of the winter and are important food source for birds and small mammals. But just like the leaves and the vines, the berries are toxic to people. 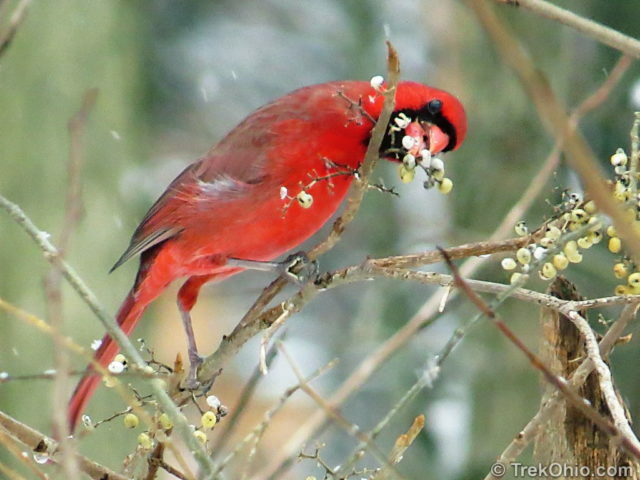 Cardinal snacking on poison ivy berries. Poison sumac (toxicodendron vernix) is a shrub with reddish stems that is often found in swamps, bogs and fens. It has compound leaves with 7 to 13 leaflets on each blade. Other than the end-most leaflet, the remaining leaflets are arranged in pairs directly opposite each other. When Poison Sumac is young, its branches and stems are red. As it matures, the bark turns a speckled brownish gray. Poison Sumac grows into a large shrub or a small tree, varying between 6 and 18 feet in height. Since it’s deciduous, its leaves turn red in the autumn and then drop off. 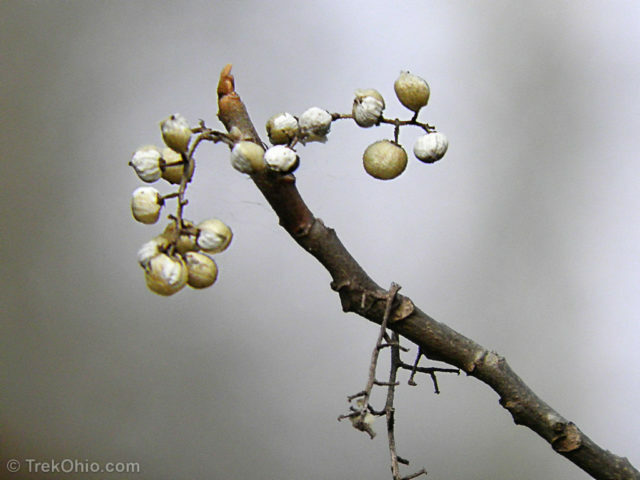 Like Poison Ivy it has green to white berries that persist into winter, drooping in clusters from its branches. Poison sumac has the unique distinction of being the most toxic plant in the United States. Below are some photos to help you identify it. 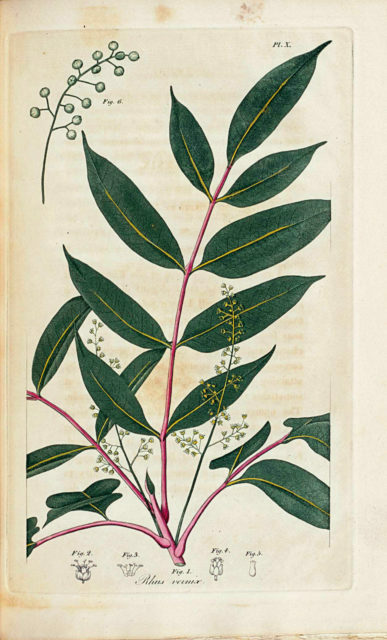 Botanical illustration of poison sumac showing is leaves, flowers and berries. We were contacted by someone who didn’t believe that poison sumac is found in Ohio, so I will address that. Although poison sumac isn’t common in our state, it is found in bogs and similar wetlands. If you look at the distribution map for poison sumac that’s displayed on the CDC’s page, you’ll see that Ohio is identified as being part of its range. The Ohio Department of Natural Resources indicates that poison sumac is located at Kiser Lake Wetlands, Burton Wetlands, and Swamp Cottonwood in its descriptions of Ohio State Nature Preserves. 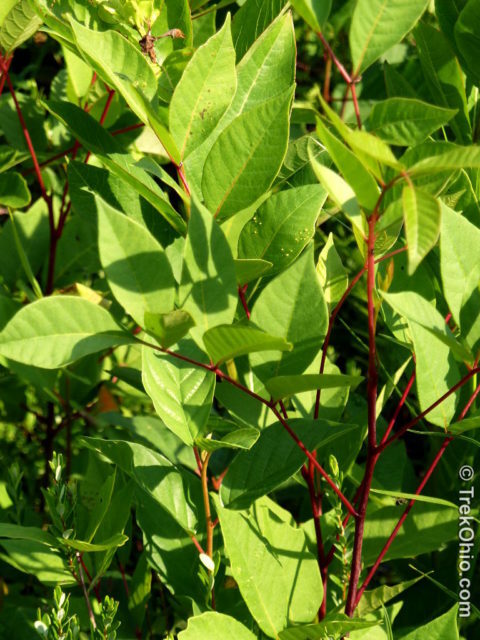 I have also seen warning signs posted in front of poison sumac at Cranberry Bog, Cedar Bog, and Jackson Bog. 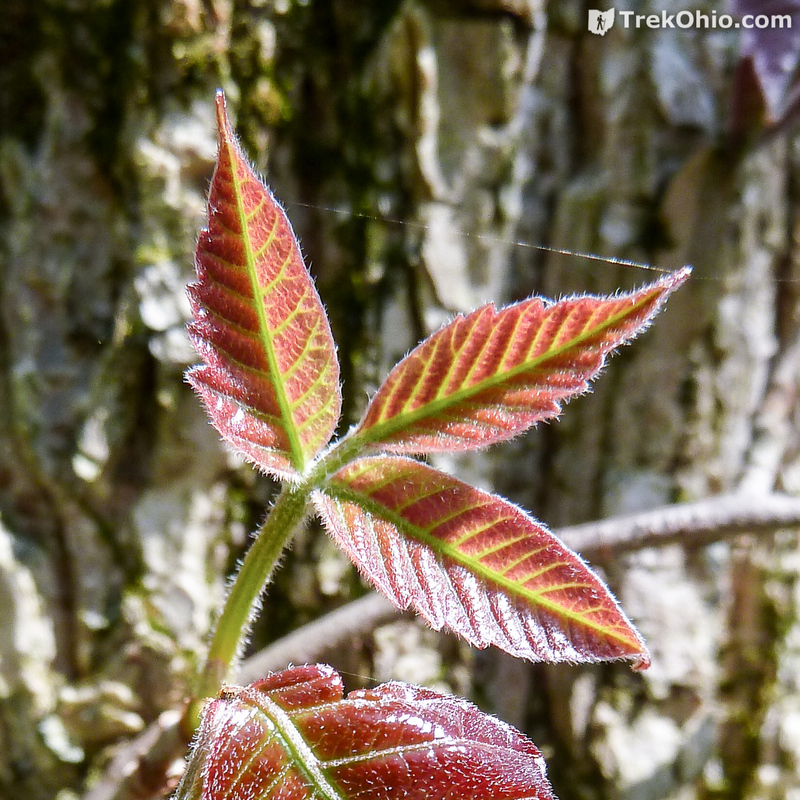 In addition most of the poison sumac photos appearing in this post were photographed by me in Ohio. 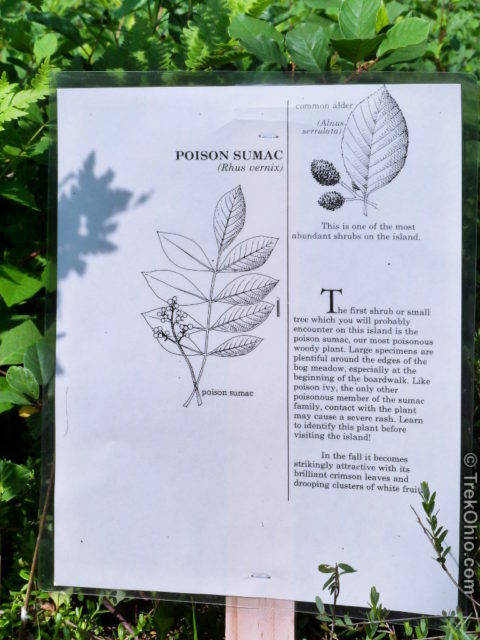 In the embedded Facebook post below, the Ohio Nature Conservancy identifies which of their preserves harbors poison sumac. Post by Ohio Nature Conservancy. 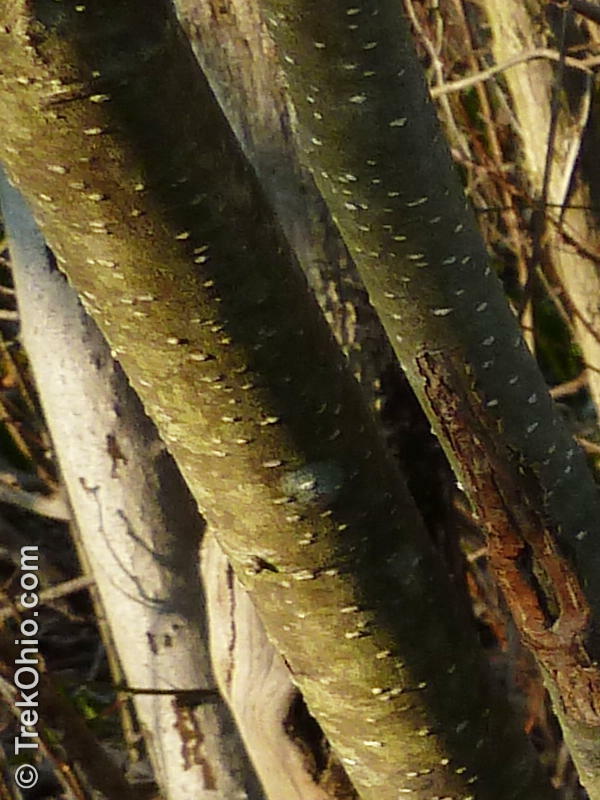 Note: Poison Oak is not found in Ohio. 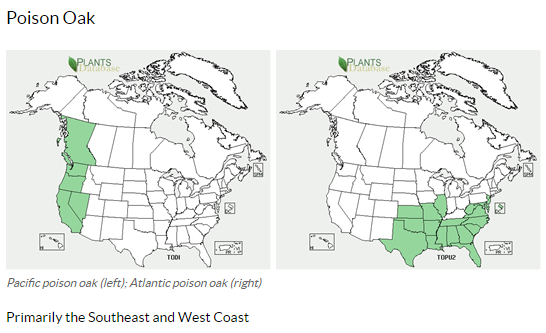 Below I have included an excerpt of the distribution map for Poison Oak that was published by the Center for Disease Control (CDC) at their site. Note that there are two types of poison oak: Pacific poison oak and Atlantic poison oak. I think that everyone would agree that we do not have Pacific poison oak in Ohio. However, people have contacted TrekOhio from time to time to say that there is poison oak here. I am assuming that they must mean the Atlantic variety. However, if you look at the map below, you can see that Center for Disease control does not believe it is in our state. I am inclined to go along with what the CDC says. This is a distribution map for poison oak provided by the CDC. You can also view these maps directly at the CDC webiste. 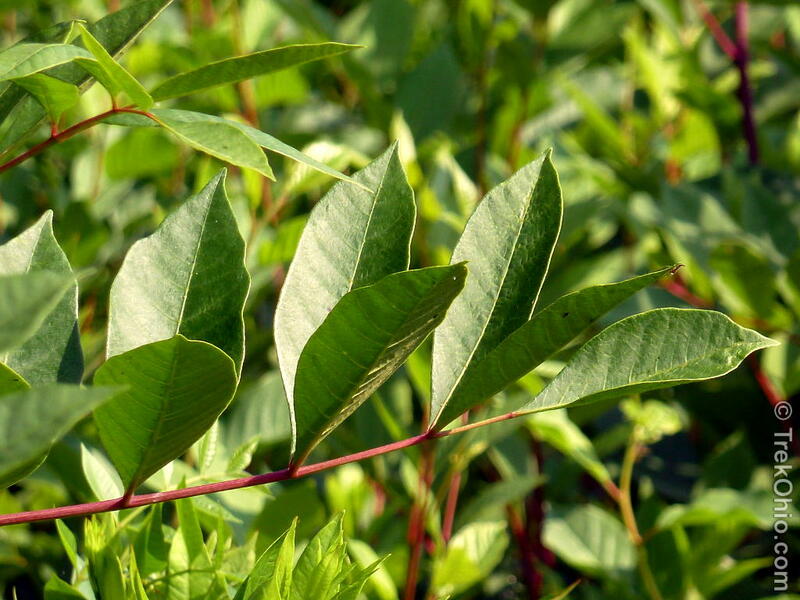 There are two rules for dealing with poison ivy and poison sumac. 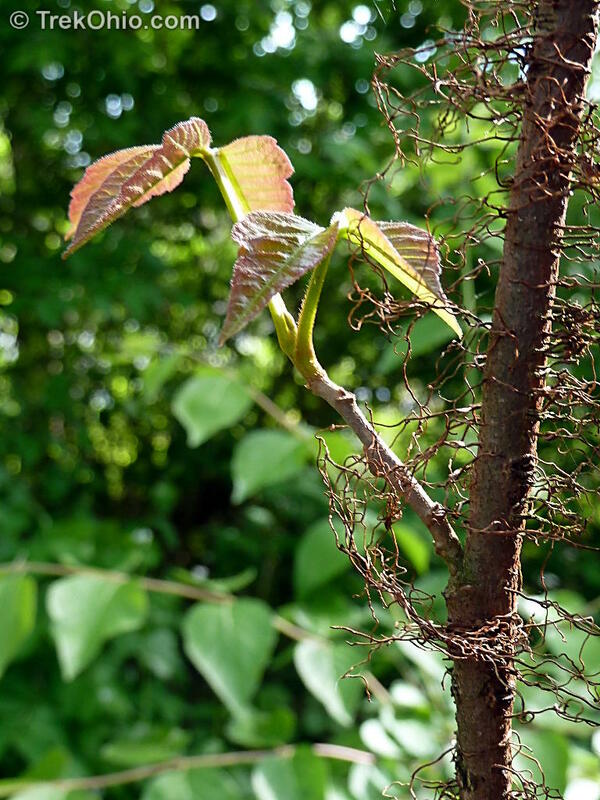 First, learn to recognize poison ivy (both as a ground cover and a climbing vine) and poison sumac plants. Second, don’t touch any part of these plants! Urushiol can cause severe reactions by contact in very minute quantities. Your best defense is avoidance. Interestingly, only humans react to urushiol; other animals are not effected. Thus, your dog can happily and safely run through a field of poison ivy getting resin all over its fur. Of course, when the resin gets transferred to you while you pet him, you won’t be so lucky. Veterinarian Janet Tobiassen Crosby discusses this problem and how to get urushiol off your pet’s fur at About.com. Weeping blisters from urushiol contact. Within about 10 minutes of contact urushiol is absorbed by the skin. You have that long to wash it off with soap and plenty of cold water (not always possible in the woods). Upon initial exposure, some people will not have any adverse reaction. Others will develop varying degrees of rash and blisters in a few days. If you are exposed to poison ivy or sumac, but don’t have an adverse reaction, consider yourself lucky. However you may not be as lucky next time; an allergic reaction can develop after repeated exposure. Avoid these plants. I should mention that if you are trying to rid your property of poison ivy / sumac, NEVER burn them. Burning them produces a toxic smoke that can cause a severe allergic reaction within the respiratory tract of the person who inhales it. For a more information on the danger of burning these plants, see either the federal government’s website for the Center for Disease Control (CDC), or WebMD. There are many suggested treatments for the itchy rash caused by these plants. Severity of the reaction and duration vary widely, as does each individual’s response to various treatments. 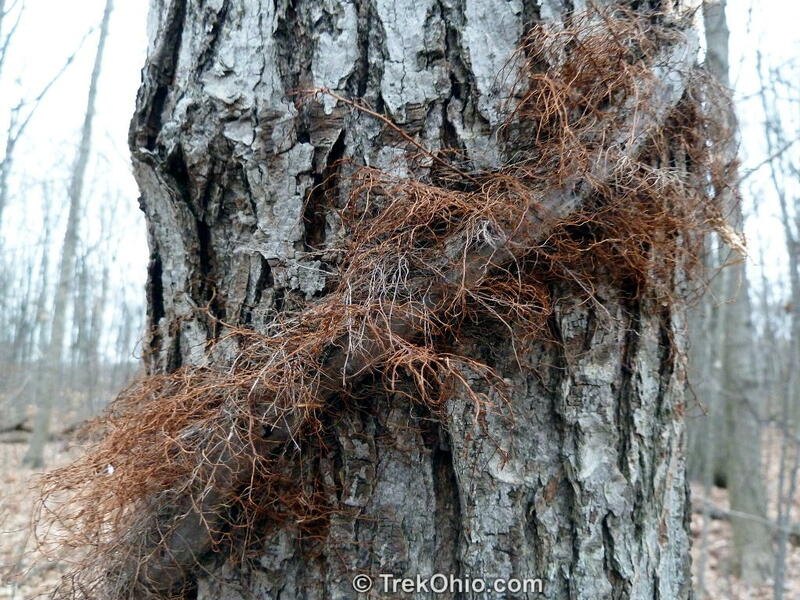 I’ve provided a few links to articles on treating rashes produced by poison ivy / sumac. Finally, don’t let poison ivy / poison sumac scare you away from the woods. I’ve managed to avoid contact and Deb has only had two incidents of poison ivy rash (one while gardening at home). 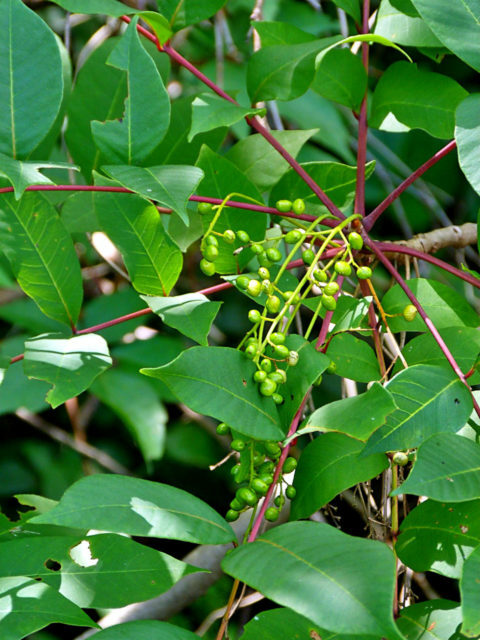 Share the post "Poison Ivy & Poison Sumac"
Thanks for telling us about this product. I hadn’t heard of it myself, and I’m sure that other readers of this article will also be interested. Some Walmart’s have it & also Walgreens – If they don’t, you should be able to have them order it ( but I have found some places don’t have it & won’t order it either) – research first ! There are now two strengths & Calagel, a clear gel to help with the itching & drying after using the Tecnu – I just put on a few times a day – Best stuff ever !! my aunt who is a (Mennonite) told me to scratch my poison ivy till it bled then pour some bleach on it. anyone ever hear of this trick. 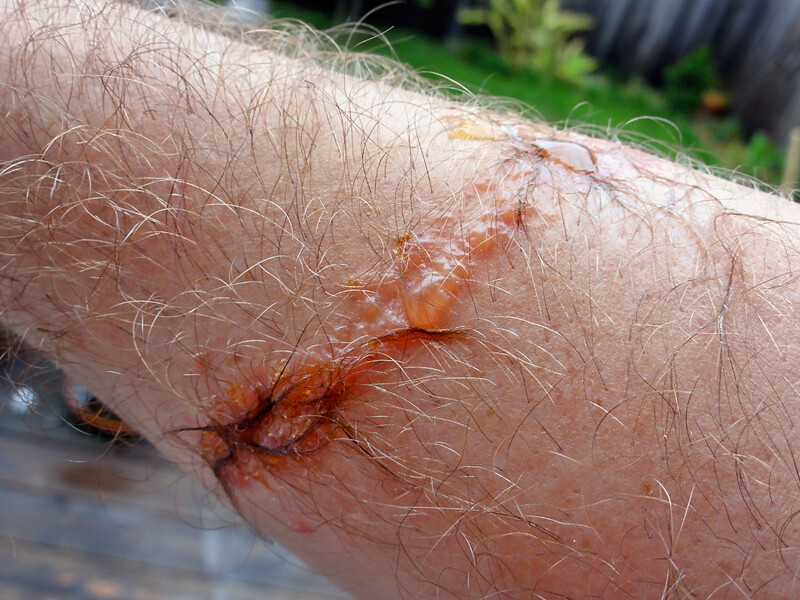 Please see this article on why you should not use bleach to treat poison ivy. I have had poison ivy a few times,and it makes you miserable. After gardening I wash immediately. I find the best thing to use is Dawn dish soap. It works the best. I’ve used the poison ivy bar soaps to no avail. I live in Northeast Ohio and have poison oak, so YES you can find poison oak in Ohio. Great job explaining why we should (and, more importantly, HOW we should) avoid poison ivy. Awesome article. I haven’t herd some of the rhymes before but the are great. I actually printed this out and I’m going to keep it in my pack to show others. Taking our grand-youngnz to the “49th annual, Hocking Hills Winter Hike” 1-18-2014 and wanted to see if ivy and oak are catchable in winter. Maybe we’ll see you their. info good to know, by the way my horses and goats ate poisen ivy I used to be able to pick it and no problem now I react to things like grasses, weeds, and ivy I used to not react to. once I pulled some baby wild cherry saplins with my bare hands (bad Idea!) my hands broke out so badly I was in tears from teh itching. the only thing that helped the itching, outside medications, is cayenne pepper, soaking my hands in it after putting alot in water. never again do I pull anything without gloves on anymore. I had a number of encounters with poison ivy, but I didn’t get a rash. Then one day there were a few teeny, tiny poison ivy leaves in my lawn. My husband mowed the lawn, so not only were the leaves tiny, but they were all chopped up. Anyway I had no idea that they were there, and I kneeled on top of the chopped up poison ivy while doing some gardening. Well that was that for me. Ever since then I have developed a sensitivity to poison ivy, and I do get a rash now if I let it contacts me. It’s amazing to think about animals eating something that affects us so badly. Very useful info;thanks for the warnings; love the rhymes to help one remember. Very good information! I must reread and reread again! I live where there is poison ivy and I always think I can point it out, but sometimes I am wrong. 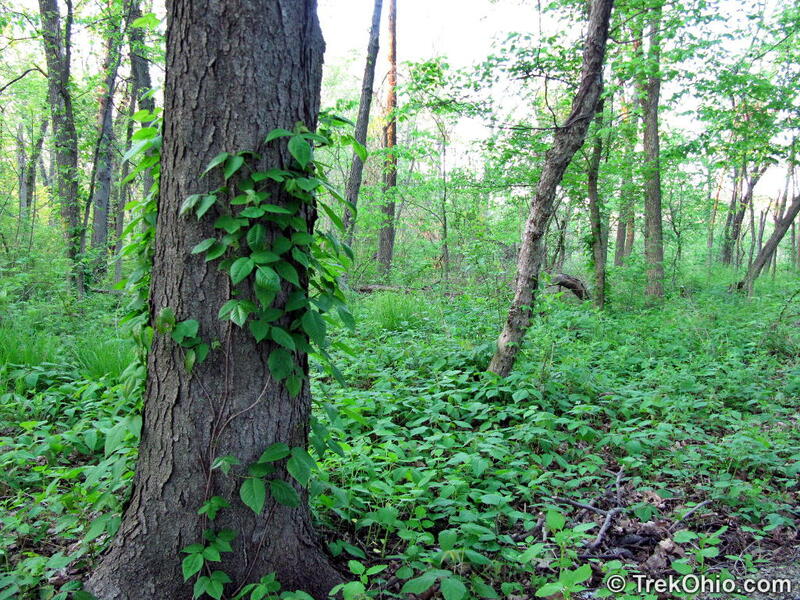 Great post – I like the poison ivy mnemonics – some I haven’t heard before. Thanks! Some of the mnemonics were new to us, too.